The first semi-final match at 3 PM was played between Loyola High School (sponsored by Salgaocar) and St. Britto High School. The score of the match opened early for Loyola’s by Aaron Barreto scoring a goal in the 11th minute. St. Britto’s tried hard to equalize but the score at the end of the first half was 1 – 0 with Loyola’s in the lead. Both teams stepped up their games in the second half and fought hard to score but it was only in the 50th minute that Warren Pereira of Loyola’s managed to score a goal. St. Britto’s fought hard but they could not stop Trinidade Osrick of Loyola’s from scoring the third and final goal of the match. With this win, Loyola’s have entered the finals. The second semi-final of the day at 4 PM was played by St. Stanislaus from Mumbai and Don Bosco’s from Goa. The match was well balanced with both schools on the attach to score and defending well. The first half was goal-less.The scene did not change much in the second half with both schools fighting hard to score but neither school could surpass the defence of the other school. No goals were scored in the second half as well. The match went into extra time but even extra time could not decide a winner. At the penalty shoot-outs, for Don Bosco’s, Aman Govekar, Edward Pereira, Sanket Kunkolkar, Aaron D;costa and Shanon Viegas scored goals. For St. Stanislaus, Josiah Noronha, Keegan Pinto, Justin Dharmai and Vicky Karkada scored goals. Don Bosco’s entered the finals by winning the match 5 – 4. 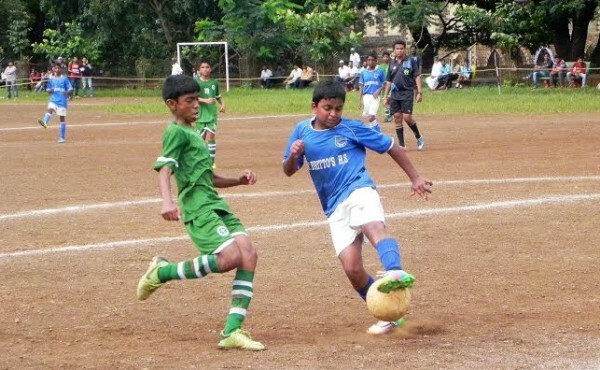 Today’s semi-finals have set the stage for an exciting finals match tomorrow at 4 PM between Loyola High School, Margao, Goa and Don Bosco High School, Panjim, Goa. The Chief Guest for tomorrow’s finals match and function is Rev. Fr. Alban D’souza, Rector, Jesuit House, Belgaum.